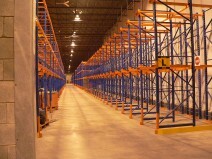 Drive-In, or Drive Through Racking are two more common forms of pallet racking each with their own unique application characteristics. Drive-through racks are designed to allow lift trucks to either deposit or retrieve loads from either end of the rack, whereas drive-in racks, although very similar in appearance, only allow entrance from one end. The basic concept of such a system is that the loads within are supported by the pallets themselves suspended by rails attached to frames on each side of a tunnel. The lift truck enters within the rack to deposit or retrieve the load and when applied effectively, this racking can be the most dense storage system available. This type of racking is a little more complex to design than a simple single select system and therefore a number of factors must be taken into account to ensure the system is a proper fit. Selectivity of product, size of the lift truck, and the nature of the product stored must all be taken into account. Saves more than floor space. It condenses storage pick faces within one area by reducing the storage floor foot print by up to 50%.